The title of this DVD does not accurately describe its three World War II stories. Instead of being untold secrets, each story has received wide publicity. Rather than changing the war, each event had negligible impact on the war's course. The DVD contains three separate short documentaries: Allied destruction of Nazi's production of heavy water (used to make atomic bombs), Japanese midget submarines at Pearl Harbor, and Japan's kamikaze attacks. These three documentaries, apparently written and produced by separate teams, have hardly any connection between them other than being on the same DVD. These supposedly three untold stories have been widely publicized. The 1948 French/Norwegian movie Battle for Heavy Water reported the exploits of Norwegian resistance fighters who sabotaged the Nazi's heavy water factory and sunk a ferry carrying heavy water from Norway back to Germany. Kirk Douglas starred in the 1965 movie The Heroes of Telemark, which told the same story although with much less historical accuracy. A midget submarine, captured on the shore of Oahu the day after the Pearl Harbor attack, toured the U.S. to help sell war bonds. Japanese filmmakers produced a feature film about the exploits of the five midget submarines used to attack Pearl Harbor, and the Japanese media widely publicized the nine men who died as heroes. Although the military kept existence of kamikazes from the American public until April 1945, soon after that many newspapers and popular magazines published articles providing details. The DVD even includes a May 1945 publicity clip about the destroyer USS Laffey, which fought off attacks by 22 kamikaze planes. The Navy displayed the ship in Seattle so the public could view damage caused by kamikaze attacks. In Japan, the media produced frequent features about the kamikaze special attack corps from its formation in October 1944 to the end of the war. 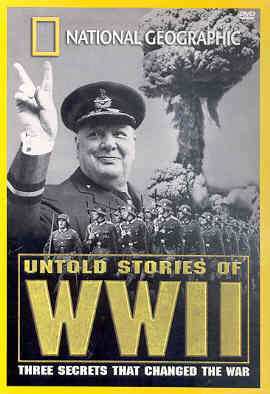 Despite the DVD title's claim that these events changed the war, in reality they had almost no effect. The Norwegian resistance fighters successfully slowed Nazi heavy water production by bombing the plant and destroyed the Nazi supply of heavy water by sinking a ferry, but the Allies learned at the end of the war that the Nazis were never close to producing an atomic bomb. The midget subs at Pearl Harbor caused no damage although two may have fired their torpedoes and missed. Four midget subs sank, and the other washed up on the shore, where the pilot was captured and become the first Japanese POW of the war. Of the three events covered in the DVD, kamikaze attacks had the most success, but they did little more than slow the inexorable American advance toward the Japanese mainland. The DVD highlights the ohka, a piloted bomb propelled by three rockets and launched from underneath a mother plane, but this weapon had very limited success. The narrator explains that American planes shot down most of the mother planes, due to their slowness, before the ohka weapons could be released. The remainder of this review focuses on the DVD's last two segments, since they both concern Japanese special attack corps that made suicide attacks during WWII. The Japanese honor the men who died in attacks by midget subs and kamikaze planes in the same way, since the men who left on these special attacks had no expectation of returning alive. These two documentary segments last only 12 to 15 minutes each, so they do not have much historical detail. Each of the last two segments lacks a unifying theme, although individual interviews of veterans and historians provide interesting facts and stories. The segment on midget subs starts with the search for a sub sunk outside Pearl Harbor by the destroyer USS Ward about an hour prior to the Japanese aerial attack, but a viewer of this DVD never finds out the results of this search as the segment wanders on to other topics. In the final segment on kamikazes, the interviews include former crewmen from the destroyer USS Laffey and members of the ohka corps. Although these interview clips provide fascinating information, the documentary provides little historical context and does not explain the relationship between these two groups. As with many documentaries about kamikaze, this DVD's narrative often does not go with the wartime film clips. As the narrator describes the kamikaze attacks on the Laffey, the screen shows various clips of attacks on other ships at other times. Two short wartime newsreels on an ohka weapon captured at Okinawa and the Laffey's survival of kamikaze attacks provide the best explanations and summaries in the documentary segment on kamikaze. Although this mistitled DVD contains some informative and interesting interviews and historical film clips, the documentary lacks focus and historical depth. 1. The end of the DVD gives 1998 as the copyright year for the documentary.